Your home's flooring is an investment - not only financially but for your health as well. Your flooring is one of the first impressions people may have of your home so it's important to maintain it to keep its luster and preserve its beauty. In addition to the aesthetic appeal, the level of cleanliness of your floor can impact the health of your family. Carpets can harbor dust mites, allergens, pet dander and other irritants that can lead to asthma, allergies and other health concerns. Our floor cleaning can help rid your home of these harmful allergens. Many consumers try DIY methods only to learn that the soaps and chemicals used can attract more dirt as well as leave behind harmful residue. That's why we offer options for all cleaning preferences and flooring types, including allergen sensitive clientele, to ensure your flooring not only looks great but provides relief from allergens. We also offer tile cleaning, concrete polishing, wood and laminate cleaning, as well as upholstery services so you can give your home a spring clean feel any time of the year. Do you have carpet or a rug that's sustained damage? We offer carpet and rug repair services. We can expertly evaluate the damage and provide you options for the repair or replacement depending on the extent of the damage. We clean all type of rugs including Oriental, Persian, wool and braided rugs using our powerful rug cleaning machines. In addition to floor cleaning, we also offer duct cleaning. Experts recommend having your ducts cleaned every 3-5 years. Our duct cleaning procedure will reduce the level of dust and allergens circulating in your home so you can breathe cleaner, healthier air throughout. One added benefit - you'll have to dust your home, less often! Flooding Disaster? Don't fret - we're here to help! We have 24/7 emergency services to vacuum up the water as well as provide drying fans to quickly return your flooring to its original condition. If your floors are beyond repair, we also provide carpet and laminate flooring removal. We will also document the damage for insurance and assist you with your insurance claim. Don't just take our word for it - read what our customers have to say about our floor, upholstry, duct, tile, grout and other residential and commercial cleaning services. I recently used A1 Carpet Care for the first time to have my carpets cleaned and I was more than satisfied with how the service went. It was a pretty big job, but the staff did excellent work, so I would definitely recommend this company to other people. Bobby and his crew did an excellent job cleaning my carpet and handling a repair as well. I will definitely call them again in the future and recommend to everyone. Juan and John did a great job on my carpets, linoleum and tile. I would recommend them to anyone and I will request them in the future. I have been using A1 Carpet Care for the past 20 years to clean my carpets. Depending on who they send, the results vary on how clean the carpets come out. I have seen them at their best and I have seen them not at their best. I had numerous carpet cleaning challenges - stairs, pet stains, area rugs and runners with fringe, etc. and all were beautifully cleaned. A1 Carpet Care is a licensed and bonded Southern California Carpet and Upholstery Cleaning company. 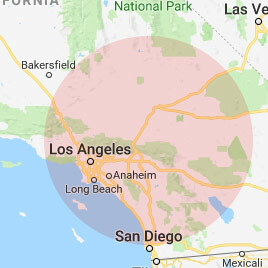 We are a local company, and have been cleaning and maintaining carpets in Los Angeles, South Bay, Orange County, Inland Empire, San Gabriel & San Fernando Valleys since 1971. Our wide range of services include Carpet Cleaning, Commercial Carpet Cleaning, Water Damage Restoration, Oriental & Area Rug Cleaning, Pet Urine & Odor Treatments, Tile, Stone & Grout Cleaning and Upholstery & Furniture Cleaning. Please feel free to contact us at any time for all of your Southern California Carpet Cleaning needs! What sets us apart from other carpet, flooring and rug specialists? Don't miss out on our floor cleaning specials. Complete our contact form today to book your next floor, rug or carpet cleaning.